For Little Naturalist Camp for 3 – 5 year olds, please click HERE. Week 1: December 26 – 28, 2018. Week 2: January 2 – 4, 2019. The ENC has offered Nature Camps since 1977! We provide quality science education in an outdoor setting. Our campers learn while adventuring! ENC Nature Camps emphasize experiential learning. Campers spend time outdoors observing Nature up close. Educational concepts are introduced in a fun environment. Campers make crafts, play games and participate in hands-on activities. Each day, campers (divided into small groups by age) will rotate between our fabulous Camp Teachers, where they will participate in exciting, age appropriate hands-on activities. 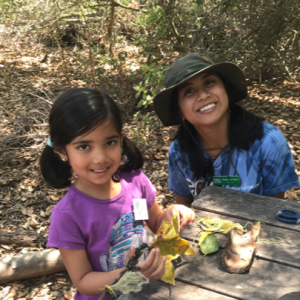 Read the Nature Camp Newsletter prior to your first day of camp! How old does my child have to be to go to Nature Camp? Kindergarten through 6th grade. My children are a few years apart, can they be in the same group? Our Campers are divided into groups by grade level. Curricula and activities are designed for these different age groups, which are developmentally distinct from each other. What is the registration deadline? All camps are open until full. An additional fee ($60 per camper) applies for late registration (less than 96 hours before the first day of a camp session). Please realize that Camp Staff does not work between 5PM on Friday and 8AM on Monday, so contacting us about late registration over the weekend may not guarantee a spot in camp for your child. How many campers are in each group? Enrollment is limited to small classes of up to 15 students per teacher (12 for pre-school groups) with a high school assistant. Refund requests made 4 weeks or more prior to the start date of camp are subject to a $25.00 fee per week of camp. Refund requests made 2-4 weeks prior to the start date of camp are subject to $50.00 fee per week of camp. Refund requests made with 1-2 weeks notice 50% refund. Less than 1 week notice no refund requests will be processed. All session changes will incur a $20.00 fee.